A little participation goes a long way. That is what we learned during this year’s Greek Week. Partnered with the men of Delta Tau Delta and Delta Upsilon, we took first place overall! 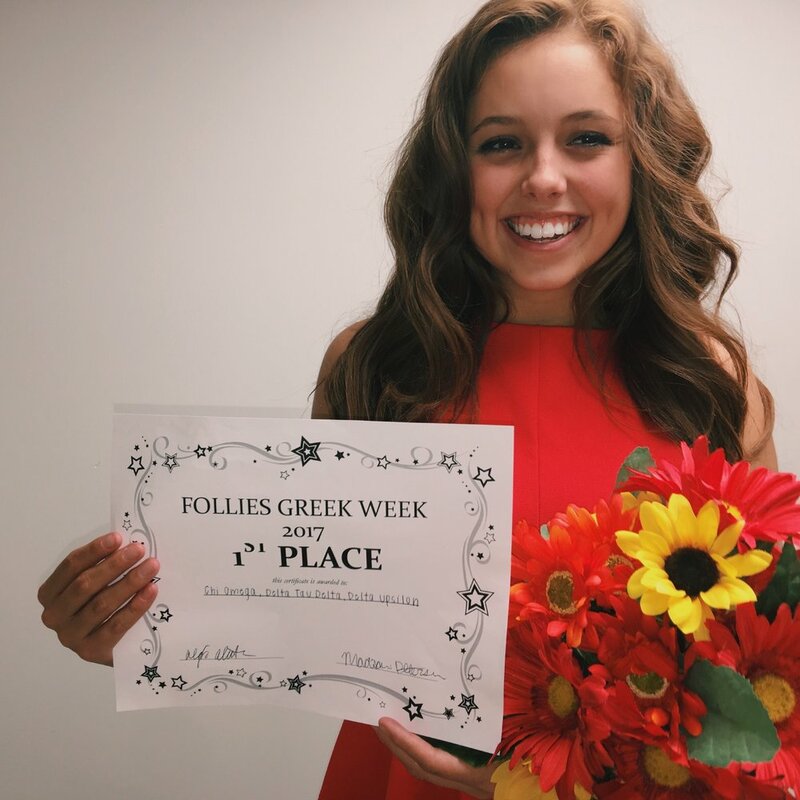 From earning the most donations through the Chipotle Community Day in the beginning of the week (we LOVE to eat), to getting crowned the champions at the dance competition called Follies, the women of Chi Omega and our pairings never failed to show up. Just ask our fearless Campus Activities Director: Katie Cable. Katie went above and beyond all year long, and it was especially apparent during Greek Week. Here is what Katie had to say about our success and teamwork. "As Campus Activities Director, it is extremely easy to say that Greek Week is one of the biggest weeks of the year. Preparations begin almost a month before, including weekly rep meetings with the other chapters, picking themes, working with dancers to participate in Follies, etc. On top of being a full-time student and working every day at the hospital, preparing for Greek Week definitely was not an easy task, but the countless hours were more than worth it in the end due to the more than incredible efforts my chapter put in every day. As Greek Week inched closer and closer, I was excited to see our participation in the multiple events throughout the week. These events included the Greek Blood Drive, Chipotle Community Day, Greek Olympics, Circle of Sisterhood Educational, etc. Our members blew me away with their responses to my requests of their involvement – we had an overwhelming amount of blood drive donors (most in the entire Panhellenic community! ), an impeccable turnout at Chipotle, phenomenal efforts in Greek Olympics (third place in tug of war! ), and other endless participation efforts throughout the week. While all of this was going on, approximately 30 Chi Omega’s teamed up with our incredible pairing, the gentlemen of Delta Tau Delta and Delta Upsilon for the Follies dance competition. Together, we created an exciting CANDY LAND production! Just ask any member – our practices were definitely a ton of work, but every time we left smiling because working together was always a blast! We took our colorful suspenders, candy cane shirts, rainbow tutus, and dyed hair and hit the dance floor on Friday night of Greek Week. We made it to the final round at Carver Hawkeye Arena, and then took FIRST PLACE overall! We also received first place for our stunning homemade banner! I am still smiling from ear to ear to this day – that victory was nothing less than sweet, and I am so incredibly proud of our team! Greek Week 2017 was hectic to say the least, but the stress comes nowhere close to the amount of fun we had every day. The week ended with the Fraternity and Sorority Life awards, where our pairing received FIRST PLACE overall for the entire week! Our members went above and beyond by working together to reach our absolute greatest potential. Everyone was "all hands on deck" from banner painting, to penny wars, to attending educationals, to cheering on our team at Carver. Our strong sisterhood has never been more apparent than it was during this week, and I will be forever grateful to have had the greatest support system on earth. I am so proud of every Psi Beta member! You ladies deserved every bit of first place! I love you all to the moon, and I can’t wait for Homecoming Week!"